A miniature tyrannosaurid dinosaur that strode on two legs across the Earth 125 million years ago has been discovered in northeast China. 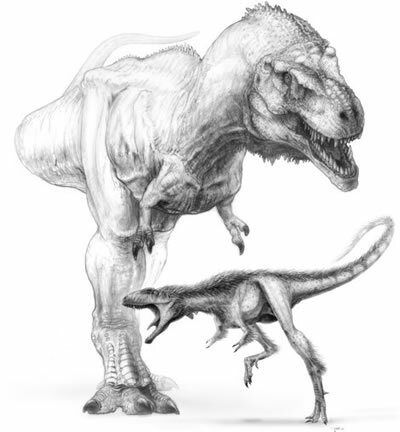 This beast had everything that Tyrannosaurus rex had, but without the bulk. Or the height. And of course, this has science fiction fans thinking of one thing. T-rex fighter pilots. T-rex starship captains. In short, lizard men of all kinds. 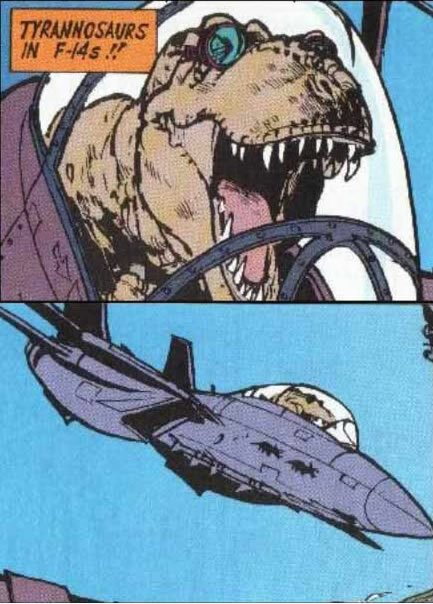 Consider the incredible tyrannosaurs in F-14s from the brilliant Calvin and Hobbes cartoons. Ordinarily, Watterson's creative play scenario would be laughed at by responsible adults (and paleontologists). No more. Except possibly for the F-14s part. Consider this vignette from the classic Star Trek episode. Captain Kirk has been beamed to a distant planet to fight an unknown enemy to the death! And what manner of beastie is this alien starship captain? Do you have any unfulfilled lizard man fantasies? Now, the fossil record has your back. From Livescience (which fortunately contains facts about this new discovery); thanks to readers for insisting on this article.